It’s not easy eating green. That dinner salad can be so boring, it requires a cloak of fat (salad dressing). But in a country that likes its bold flavors, why not try something more robust? Bitter greens add excitement in both flavor and texture. Almost a year ago we suggested perking up salad with spicy greens. Today, we take on bitter greens. Some of them, like arugula and radish, add both bitterness and heat. In salads and other dishes, balance the bitter flavor of the green with an acidic counterpoint: vinegar or lemon juice/lime juice in a vinaigrette, a splash of citrus, vinegar or white wine in other recipes. Try a new variety of bitter green each month. Look in farmers markets for less commonly found greens (that’s where we first encountered the exciting bitter greens, mizuna and tatsoi, 15 years ago). If you find that you don’t enjoy a particular bitter green in its raw state, stir fry or braise them (a recipe follows). You can top a lettuce salad with braised greens and warm vinaigrette, or serve them as a side with dinner. Either way, bacon lovers: Try this warm bacon vinaigrette. 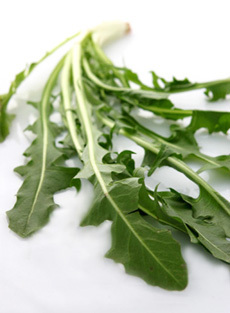 This recipe uses chard and kale, but you can use any bitter greens alone or in combination. Thanks to New Hope 360 for the recipe. 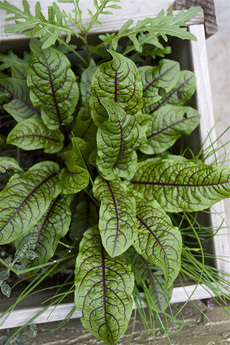 Sorrel is typically used as an herb, but makes a delicious salad green or stir-fry green. Photo of red sorrel courtesy SassAndVeracity.com. 1. SAUTÉ. In a large skillet, sauté the onion in the olive oil until translucent, about 5 minutes. Add the mushrooms. Toss to coat with oil, then continue to cook for about a minute. Sprinkle the lemon juice over the pan and cook until the mushrooms have softened, about 5 minutes. 2. COMBINE. Add the kale to the skillet, mixing it with the mushrooms and onion. Cook on high flame for about 1 minute, then add the wine and allow it to cook until the smell of alcohol evaporates, stirring constantly. Stir in the garlic and half the stock, then reduce to a simmer. Cover the pan part way and continue to cook until the kale has begun to soften, about 8 minutes. 3. COMBINE. Add the chard, toss and cook until it begins to soften. Stir in the remaining stock, salt, nutmeg and pepper. Cook, partly covered and stirring often, until the greens are tender. Raise the heat and cook quickly for a minute or so until most of the stock has cooked off. Remove the pan from the heat and stir in the butter, then immediately turn out onto a serving dish.